Here are some printable number family and number bond worksheets to show the relationships between addition and subtraction problems. Select the common core icon below each worksheet to see connections to the Common Core Standards. Here's a complete set of addition and subtraction fact family flashcards. Write the correct numbers in each addition/subtraction fact family triangle. More fact family subtraction-addition fact family triangles to solve. 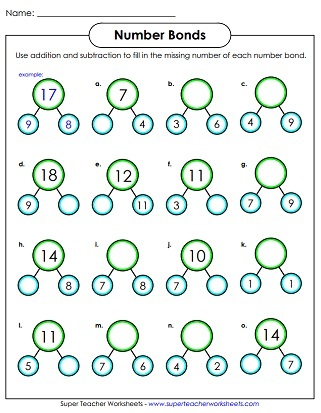 Write the correct addition/subtraction fact family for each set of numbers. 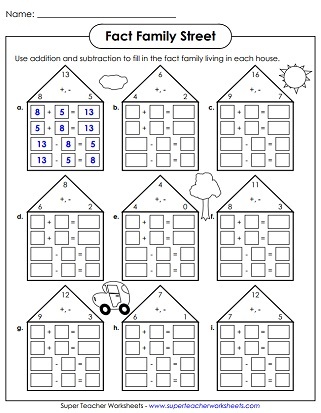 Another worksheet with fact family houses in which students much write the correct numbers. Use addition or subtraction to determine the missing number in each part-part-whole box. 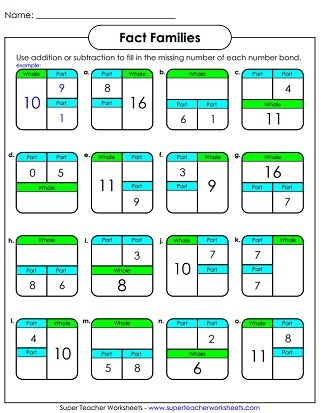 More addition-subtraction number family boxes. Complete the number family shown by each ten frame. All sums are 10 or less. Complete the number family shown by each pair of ten frames. All sums and minuends are 20 or less. Add or subtract to find the missing part of each number bond. Another set of add-subtract number bonds.